Application Deadline: 12 noon, 22nd April 2016. Applications are invited for an AHRC-funded PhD studentship on the role of women as disseminators of knowledge about the Old Masters, focusing especially on those who induced a greater interest in the collection at Trafalgar Square. It explores the social and cultural history of the Gallery’s present-day efforts to democratize access to its collections and reach new audiences by examining the understudied critical and art-historical writings of nineteenth-century women, which typically had a more popular reach than that of their male counterparts while also speaking to specialists, then and now. This studentship is one of a number awarded to the National Gallery, as part of the AHRC’s new Collaborative Doctoral Partnership Scheme. The supervisors of the project have identified the following issues for research, although the student has the scope to develop both the topic and approach, in conjunction with the supervisors. What contribution did Victorian women writers make to scholarship on the Old Masters in the National Gallery’s collection? Did women tend to write about particular artists and periods, and if so why? Did their work affect the canon? How was their work received, and what was its reputation? What has been the subsequent fortuna critica? How might it speak to modern audiences? Through what networks were these women connected with the National Gallery? How important to their success were such networks and relationships? To what extent did these women’s writings affect acquisition and collecting behaviours at the National Gallery and in the private sphere? Were their opinions taken seriously by the institutional art world? What forms did the work of women writers take, and to what audiences was it was addressed? What was the effect of their cross over between different genres and media? What was the role of the penny press in widening access to the Old Masters in the mid nineteenth century? Were women writers interested in the role of the National Gallery and other art institutions as places of advocacy for mass education? This project will be supervised by Professor Hilary Fraser, Geoffrey Tillotson Chair in Nineteenth-Century Studies and Dean of Arts at Birkbeck, University of London, whose recent work focuses on women writers and the emergence of art history in the nineteenth century, and Dr Susanna Avery-Quash, Senior Research Curator in the History of Collecting at the National Gallery, whose research interests encompass the history of important private and public art collections. This studentship will provide the student with invaluable academic skills and experience of working in a major national art museum, as well as deep understanding of women and nineteenth-century approaches to the Old Masters. It will involve the student in a range of interdisciplinary research activities, drawing on archival and primary textual material, various types of art collections and the resources of the National Gallery and Birkbeck. In addition to working directly on the PhD thesis, it is envisaged that the student will also be engaged in a range of related activities, such as the delivery of research papers, assisting with conference organization, and contributing to a Room 1/Sunley Room exhibition at the National Gallery. She or he will also be expected to play a full role in the research cultures of both institutions. In January 2015, 12 of France’s most familiar cartoonists were shot dead in Paris. The aftermath of the attack on Charlie Hebdo raises significant questions about the status and the potential impact of an image and gives this conference a political urgency. The events in Paris underline both the power of the political cartoonist and the dangers of causing offence to political and religious sensibilities. In 1820, George Cruikshank and his brother Robert were summoned to Brighton Pavilion by George IV, in an attempt to buy them off from reproducing their salacious satirical cartoons. They were paid off, but continued to produce scurrilous images of the royal family and political figures. The Royal Pavilion now houses one of the best collections of Cruikshank, Hogarth and Gillray in the world, three of the most eminent caricaturists in visual history. The city of Brighton and the University have a long history of association with cartoon and caricature. This conference offers the opportunity to celebrate the rich history of caricature and cartoons associated with Brighton and to address the important ethical questions that now confront the contemporary cartoonist. It celebrates the rich collections of Cruikshank, Gillray and Hogarth at the Brighton Pavilion and brings together the expertise of practitioners, curators, academic historians and cultural analysts. The conference draws upon the research expertise of the University, on the curatorial experience of museum staff and on cartoonists who currently practice. This conference is organised by three research groupings from the College of Arts and Humanities at the University of Brighton, the Centre for Applied Philosophy Politics and Ethics, the Centre for Research in Memory, Narrative and Histories and C21: Research in Twenty-First Century Writings, which allows for the interdisciplinary focus that the subject merits. Comedy and ethics – what are the responsibilities of a cartoonist? || The curation of cartoons – what should be kept? || How far can you go? Are there limits to what a cartoonist can lampoon? || The legacies of Cruikshank, Gillray and Hogarth || Religion and caricature || Representations of history through cartoon || The impact of caricature on popular ideas of politics || Celebrity and caricature || In what contexts does satire flourish and why? || Is satire necessary? Sequential narration in satiric prints is most famously associated with the “modern moral subjects” of William Hogarth (1697–1764): Harlot’s Progress (1732), A Rake’s Progress (1735), Marriage A-la-Mode (1745), and Industry and Idleness (1747) among others. Less well-known is the broad spectrum of legacy “progresses” produced by subsequent generations drawing both on Hogarth’s narrative strategies and his iconic motifs. James Gillray (1756–1815), celebrated for his innovative single-plate satires, was also among the most accomplished printmakers to adopt Hogarthian sequential narration even as he transformed it according to his unique vision. 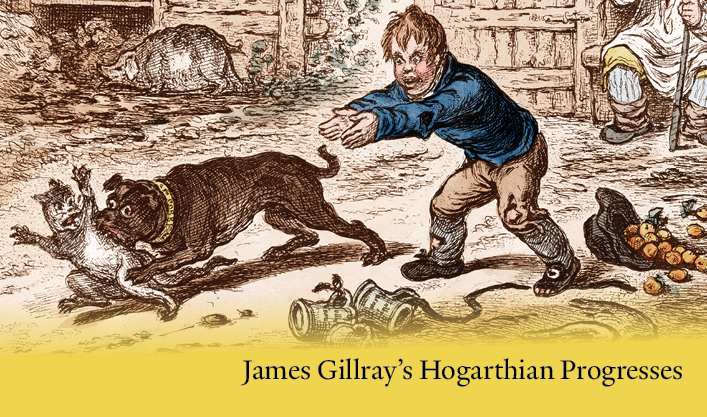 This exhibition presents a number of Gillray’s Hogarthian progresses alongside some selected prints by Hogarth himself. Curated by Cynthia Roman, Curator of Prints, Drawings, and Paintings, The Lewis Walpole Library.